Buying a home is exciting! It can also be stressful. Having a home inspected by a highly-qualified professional is the best way to reduce uncertainty about your potential new purchase. That's why we're committed to providing solid information in an interactive report. Francis Caza, RHI (Registered Home Inspector) is a past chair of the Ottawa chapter of the Ontario Association of Home Inspectors (OAHI). 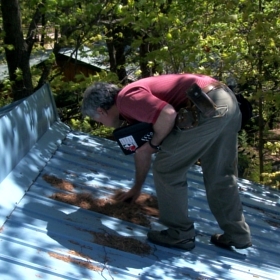 He has worked in home construction in Ottawa-Gatineau for over 35 years. It is this expertise that Francis brings to your home inspection. A pre-purchase home inspection provides you with solid information about the home you hope to fall in love with. Addressing a problem in the home you are about to sell will prevent that unwanted surprise later on in the process. Knowing the structural and systems strengths of your home in advance will give you important positive information to relay to a potential purchaser. All homes have some defects – even new ones. If you catch a problem with a new home, you can ask the builder to repair it early on in the process. An inspection can save you money in the long run. Francis Caza, RHI (Registered Home Inspector) is a member of the Ontario Association of Home Inspectors (OAHI). We're committed to providing solid information in an interactive report. For more information, please call us at 613-913-9020. Why a Registered Home Inspector?